When U.S. markets awaken Wednesday, China’s third quarter economic growth will be at center stage. If the number is lower than expected, global markets won’t be happy and the iShares MSCI Emerging Markets exchange-traded fund (EEM) could come under pressure. But SGH Macro Advisors CEO Sassan Ghahramani and Kevin Muehring, senior managing director, note that the Chinese government has broadcast a narrow outcome, based on government GDP estimates cobbled together from nine departments. GDP is expected to be between 6.7-6.8%, and should remain around 6.7% in the fourth quarter, “with a slight lean to 6.8%,” note the folks at SGH, a consultant to asset managers and policy makers on the global economy. 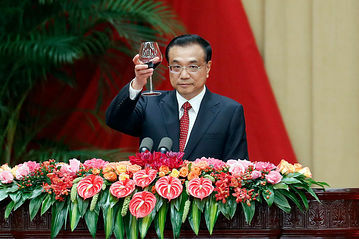 Chinese Premier Li Keqiang raises his glass during the 67th National Day reception Sept. 30. “The People’s Bank of China will continue to manage the RMB to balance between the USD and a basket of currencies, meaning under current conditions the RMB will depreciate against a stronger dollar, while appreciating against the basket, and vice versa if the dollar trend shifts. Officials do not expect the RMB to break 6.7500 this month. … Premier Li Keqiang will chair a meeting to analyze the numbers. All nine departments expect Q3 GDP to come in at least at 6.7% and for CPI to recover from 1.3% in August to about 1.8% in September. More than half – five of the nine departments – expect GDP to come in at 6.8%, including the PBOC and powerful NDRC. Four others, including the Ministry of Finance, expect 6.7%. As we noted in the post China Investments: On Cusp Of ‘Paradigm Shift’?, some Chinese internet plays have been investor favorites this year: Netease (NTES) is up 47% this year, Tencent Holdings (TCEHY) is up 39% and Alibaba Group Holding (BABA) is up 28%. Those returns are much better than the performance of the iShares China Large-Cap ETF (FXI), up 7%, and the Deutsche x-trackers Harvest CSI 300 China ETF (ASHR), down 11%.